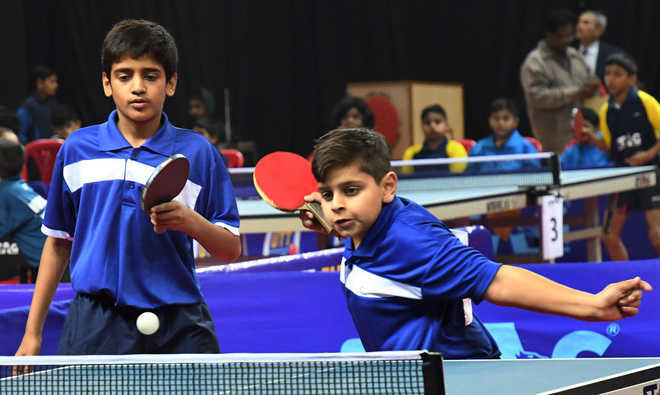 Chandigarh boys lost 0-3 to their much fancied opponents from Tamil Nadu and crashed out of the cadet team competition on the second day of the 80th Cadet and Sub-Junior National Table Tennis Championships at the Sector 42 Sports Complex here on Wednesday. Punjab boys, though, surprised everyone with their 3-1 victory over Gujarat in the pre-quarterfinals. Gujarat took the lead when Himansh Dahiya beat Tanish Sharma 11-9 12-10 9-11 11-4 in the opening match, but Suhaan Gulati blanked Vivek Patel and then combined with Sahil Rawat to down Dhyey Shah and Bhavya Patel 11-8 11-9 11-5 to give Punjab the edge. In his reverse singles match, Gulati registered an 11-5 11-5 12-10 win over Dahiya to ensure Punjab moves into the quarterfinals. The side, however, could not go beyond the quarterfinals as they went down 2-3 to Maharashtra A.
Tamil Nadu registered a 3-1 win over Delhi in the quarterfinals, and will play Haryana for a place in the final. Haryana paddlers blanked Rajasthan before beating North Bengal 3-1 in the quarterfinals. Meanwhile, in the sub-junior girls’ competition, it was as easy as it could get for teams like Maharashtra A, Gujarat, Karnataka, Tamil Nadu, Telangana and West Bengal. Maharashtra A drubbed Goa before taming Gujarat 3-0 to set up the semifinal clash with Karnataka, which outplayed Uttar Pradesh 3-0 and then overcame Delhi 3-1 in the quarterfinals. Tamil Nadu girls got the better of Maharashtra B to ease into the semifinals, where they will face West Bengal. Tamil Nadu boys overcame Maharashtra A to seal a spot in the sub-junior boys’ semifinals. The team from South will fight North Bengal for a place in the final. Delhi boys will lock horns with Telangana in the other semifinal. In the cadet girls’ championship, Maharashtra A will face Maharashtra B in the semifinals, while Karnataka will take on West Bengal.